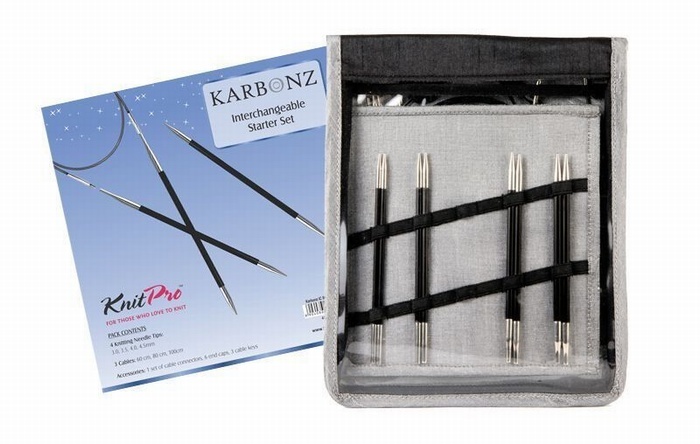 KnitPro Kabonz Interchangeable Starter Knitting Needle Set.<br> <br> These new-age needles are made from high tech carbon fibre with tips in nickel plated brass. The combination of these two versatile materials - light bodied carbon fibre and sharp brass tips - provide an unparelleled knitting experience! Carbon fibre is one of the most versatile materials used in the manufacture of the new generation aircraft, space ships, cars and more. <br> <br> The shiny, smooth brass tips have perfect points and are flawlessly tapered - they're ideal for all types of yarns and for every project. The needles have high strength, and are light weight with lots of flexibility. The carbon fibre surface helps stitches move smoothly on the needle. These beautiful needles are warm to the touch, and are an absolute pleasure to knit with. <br> <br> The set contains: <br> 4 pairs of needle tips in sizes 3.0, 3.5, 4.0, 4.5 mm (US sizes: 2.5, 4, 6, 7 ) <br> 3 cables to make 60cm/24", 80cm/32" and 100cm/40" (final cable length is achieved when both needles and cable are joined together) <br> 6 end caps <br> 3 cable tightening keys <br> Black and grey fabric case. <br> Also includes a bonus set of cable connectors. KnitPro Kabonz Interchangeable Starter Knitting Needle Set. These new-age needles are made from high tech carbon fibre with tips in nickel plated brass. The combination of these two versatile materials - light bodied carbon fibre and sharp brass tips - provide an unparelleled knitting experience! Carbon fibre is one of the most versatile materials used in the manufacture of the new generation aircraft, space ships, cars and more. The shiny, smooth brass tips have perfect points and are flawlessly tapered - they're ideal for all types of yarns and for every project. The needles have high strength, and are light weight with lots of flexibility. The carbon fibre surface helps stitches move smoothly on the needle. These beautiful needles are warm to the touch, and are an absolute pleasure to knit with. Also includes a bonus set of cable connectors.